Canada’s participation in the Boer War or South African War, fought from Oct. 11, 1899 to May 31, 1902, was essentially based on economic and political grounds. Nevertheless, our involvement yielded five Victoria Cross recipients. Four were soldiers in the Canadian Army while the fifth was a member of the British Army. The bad feelings between the British and Dutch-speaking farmers or Boers in the Cape Colony had its roots extending back over a century. They were brought to a head in 1834 when the British Parliament abolished slavery, a move that upset the Boers’ economic structure, and sent them packing into the interior in search of better land, labour and freedom from British control. This resulted in the Orange Free State. For a while the differences were social, ethnic, linguistic, legal and cultural, but with the discovery of diamonds in 1873 in the Transvaal, and gold a year later, the struggle turned into an economic one and war became inevitable. When war did break out, these were hardly factors to appeal to a Canadian sense of patriotism or obligation to the mother country. However, participation in the war was seen by English-speaking Canadians as an opportunity to demonstrate unity, strength, character, to shed the irksome colonial status and become a partner in imperial affairs. Canada could also profit commercially with the manufacturing of uniforms, equipment and saddlery. As a bonus, the contribution of more than 7,300 Canadian volunteers to the cause gave Canada its first sense of military maturity and resulted in the organization of a proper militia. The first Boer War VC recipient with a Canadian connection was William Henry Snyder Nickerson of the Royal Army Medical Corps (RAMC). Born in Dorchester, N.B., on March 27, 1875, Nickerson was attached to the Mounted Infantry and awarded the medal for his part in an attack on Bwab’s Hill. At nearby Wakkerstroom, a trooper from the Worcestershire Regiment had had his stomach torn open by shellfire and lay exposed to a concentration of fire from the Boers. The wounded soldier could not be moved nor could stretcher-bearers reach him until the fire abated. That night, during an infantry assault to aid the mounted troop, Nickerson went forward and under heavy shell and rifle fire stitched up the man’s stomach and stayed with him until he could be moved to safety. In addition to earning him the VC, the deed resulted in Nickerson receiving a Mentioned-in-Dispatches. The second Canadian VC of the Boer War was Arthur Herbert Lindsay Richardson of the Lord Strathcona’s Horse. On July 5, 1900, at Wolve Spruit, near Standerton, a party of 38 Strathconas engaged an enemy force outnumbering them by two-to-one and forcing them to retire. During the skirmish, one of the Canadians was hit in the arm and leg, and his horse—–which was also hit—stumbled and fell on top of him. Richardson, who at the time was ill and weak with fever, wheeled around to within 30 yards of the Boers who kept up a steady fire. He dismounted and pulled the injured soldier out from under his horse. Although Richardson’s horse was also wounded he was able to remount, pull the wounded man across his saddle, and ride back to camp, thus saving the man’s life. 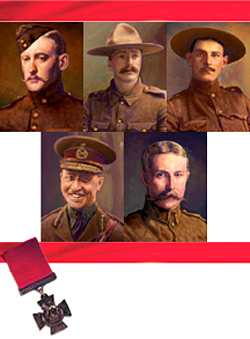 The other three Canadians to earn the VC during the Boer War all served with the Royal Canadian Dragoons and all were for feats during the Battle of Liliefontein on Nov. 7, 1900. They were Lieutenant Richard Ernest William Turner, Sergeant Edward James Gibson Holland and Lieutenant Hampden Zane Churchill Cockburn. The part played by the RCDs was a rearguard action on the Komati river basin, in the northeastern Transvaal, to prevent the Boers from seizing a pair of 12-pounder guns they had captured a few days earlier. It was the only full-scale cavalry charge the Boers ever made, involving more than 600 troops. When the attack started, Turner ordered his troops to dismount with the exhortation: “Never let it be said that Canadians let their guns be taken!” Nor did they. The main body of the enemy charged straight for Turner wounding him in the neck and badly shattering one arm. As the Boers veered away they went after Holland, who was in charge of the Colt machine-gun on the dragoon’s left flank. Meanwhile, Turner stayed his ground until the artillery could be pulled back. Holland’s horse was blown out from under him. Stooping, he disconnected the barrel of the Colt and staggered off towards the gun carriage which was pulling away. A cry went up: “Wait for Eddie Holland!” One of the gunners heaved him aboard, then ran alongside the gun as the driver drove off. Holland’s hands were a mess because the barrel of the Colt had been white hot when he dismantled it. When the Boers reached the position they at first thought they had captured the gun, but when they saw that the barrel was missing they became so furious they set fire to the carriage. Though the enemy came within 70 yards range during the artillery withdrawal, Cockburn and his party deliberately sacrificed themselves by standing their ground to allow the artillery to get away. Cockburn was badly wounded and most of his men were killed or taken prisoner. Nickerson, the son of a British army chaplain, was educated at Portsmouth Grammar School and took his medical training at Owen’s College, Manchester University in England. He enlisted in the RAMC on July 27, 1898, as a lieutenant and was subsequently promoted to captain. In 1909 he became a major and in World War I served in the cavalry in Europe and Salonika where he was Mentioned-in-Dispatches three times. Nickerson was later attached to the Scots Guards in the London District and then the Horse Guards at Whitehall. He died April 10, 1954 and was buried at Cour, Kintyre, Scotland. Richardson, who was born in Southport, England, on Sept. 23, 1872 was brought up in Liverpool. At age 21 he emigrated to Canada, and after working as a rancher joined the North West Mounted Police. At the outbreak of war he took a leave of absence and joined the Canadian Army. After the war he rejoined the Mounties until ill health forced him to retire. He was made constable of Indian Head, Sask., but poor health forced him to give that up as well. After that he became dependent upon the welfare of the townsfolk. In 1908, Richardson returned to Liverpool. Little is known or was heard of him until the Dec. 16, 1932 issue of the Liverpool Post and Mercury newspaper. In it was a story that described him as the “Shy VC” who worked as a “tramway ganger, cinema attendant and so on, unknown to his relatives (his wife reportedly died in 1910) who believed him to be dead.” Richardson apparently went into seclusion until 1924 when, the newspaper reported: “There was a happy reunion between the long lost VC and his mother and eldest brother.” Richardson later found employment as a foreman with the Edge-lane tram depot. Although he preferred the role of a recluse, ironically a namesake had been impersonating him in Scotland where he was widely feted and honoured wherever he went. The imposter even had the effrontery and gall to attend a garden party for VC holders hosted by the king at Buckingham Palace. His role as a fake went unrevealed until the real Arthur Richardson died in Millroad Hospital, Liverpool, and was buried with full military honours on Dec. 15, 1932. Lieutenant-General Sir Richard Turner was one of Canada’s most distinguished military figures. Born in Quebec City on July 25, 1871, after graduating from school he joined his father in the family grocery business. In 1892, he joined the militia as a second lieutenant in the Queen’s Own Canadian Hussars. By 1895 he held the rank of captain. In 1900, when the Special Force was organized for service in South Africa, he joined the Canadian Mounted Rifles, later amalgamated into the Royal Canadian Dragoons. In addition to earning the VC, he was awarded the Distinguished Service Order as well as the Queen’s Medal with clasps for Belfast, Cape Colony, Orange Free State and South Africa. Following the Boer War, Turner’s military career was no less impressive. By the start of WW I in August 1914, he commanded the 3rd Infantry Brigade with the rank of brigadier-general. In April 1915, he played a key role in the Second Battle of Ypres when, as British Prime Minister Lloyd George said, “the Canadians saved the British Army.” To break the entrenched stalemate from the North Sea to the Swiss border, the Germans unleashed 160 tons of poison gas against the Allied trenches. The French defences on the left flank collapsed, but the Canadians stood firm. In the midst of the action, Turner prevented the Germans from cutting around behind his brigade until a British detachment arrived to fill the gap. On Aug. 17, Turner was given command of the 2nd Canadian Division with the rank of temporary major-general and later, on Dec. 16, took command of the Canadian forces in the British Isles. On June 14, 1917, he received a knighthood and a year later was elevated to the rank of lieutenant-general. In May 1918 he was appointed Chief of the General Staff, Overseas Military Forces of Canada. By this time his decorations included six Mentioned-in-Dispatches, the French Légion d’honneur, Croix de Guerre avec Palme and the Russian Order of White Eagles. In 1919, Turner returned to the family business in Quebec City, but continued to serve the Canadian military in a variety of capacities. He was honorary colonel of several regiments and took an active part in their affairs. He became one of the founders and a grand president of The Canadian Legion of the British Empire Service League and up until his retirement on July 14, 1941 was a member of the Canadian Services Commission. Turner died at the Ste-Foy Veterans Hospital in Quebec City on June 19, 1961, at age 90. He was buried in Mount Hermon Cemetery with full military honours. His VC, other medals, sword and silver tray were on display in the museum at Canadian Forces Base Gagetown, N.B., until 1993 when they were transferred to CFB Petawawa, Ont. Edward Holland was born in Ottawa on Feb. 2, 1878, and was educated at the Model School and the Ottawa Collegiate Institute. At age 17, he joined the militia and served with the 43rd Regiment and the 59th Princess Louise Dragoon Guards from 1895 to 1897. In 1899, he served with the 1st Canadian Mounted Rifles Battalion—later part of the Royal Canadian Dragoons. In 1901, he was granted a commission in the Princess Louise Dragoon Guards. In addition to earning the VC during the Battle of Liliefontein, Holland’s service in South Africa earned him the Queen’s Medal with clasps for Belfast, Cape Colony, Diamond Hill, Johannesburg and the Transvaal. In 1904, Holland became a major in the 13th Scottish Light Dragoons, and in 1914 was given command of the Borden Motor Machine-Gun Battery which he took to France on Sept. 14 of the following year. In October 1916, he returned to Canada and was transferred to the reserve corps. He retired from the army at the end of WW I, and eventually became postmaster of Cobalt, Ont., where he died on June 18, 1948 at age 70. Holland’s VC and medals were also in the custody of the museum at CFB Gagetown until they were transferred to CFB Petawawa in 1993. Born in Toronto on Nov. 19, 1867, Hampden Cockburn was educated at Upper Canada College, as well as Rugby School and London University in England, and the University of Toronto. At war’s outbreak he gave up his law practice and enlisted in the Canadian Mounted Rifles, later incorporated into the RCDs. During the Boer War he took part in 45 different engagements. In addition to earning the VC, he was decorated with the Queen’s Medal with clasps for Cape Colony, Diamond Hill, Johannesburg and Orange Free State. On Oct. 11, 1901, Cockburn was invested with his VC by the Duke of York and Cornwall. At the same time he received a sword of honour voted to him by city council. In recognition of his services, he was appointed a major in the Governor General’s Bodyguard. Cockburn later moved to Western Canada where, on July 13, 1913, he was killed in a riding accident on his ranch at Maple Creek, Sask. Under the terms of his will, his VC and sword are displayed in the lobby of Upper Canada College. Find out what’s cooking. 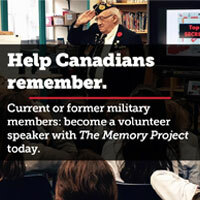 Sample this selection of news involving veterans, the military, the Legion and selected national issues. And don’t forget to check out the archives section for previous developments.